"A weekly display of intellect, wit, conscience and high drama, it has explored possibilities for statesmanship that seem rare in the real corridors of power." 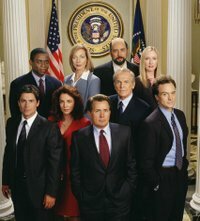 “West Wing” taught us that, despite the mudslinging that can create a stench in Washington, politics can remain a noble profession. The selfless men and women who serve do so not out of ego, but out of wanting to make government both a beacon and a safety net for the benefit of others. So, thank you President Bartlet, Mrs. Bartlet, Toby, Josh, Leo, Sam, Will, C.J. Donna, Charlie, President-Elect Santos, Arnie, and all the rest, it was a great ride and I will miss you! !